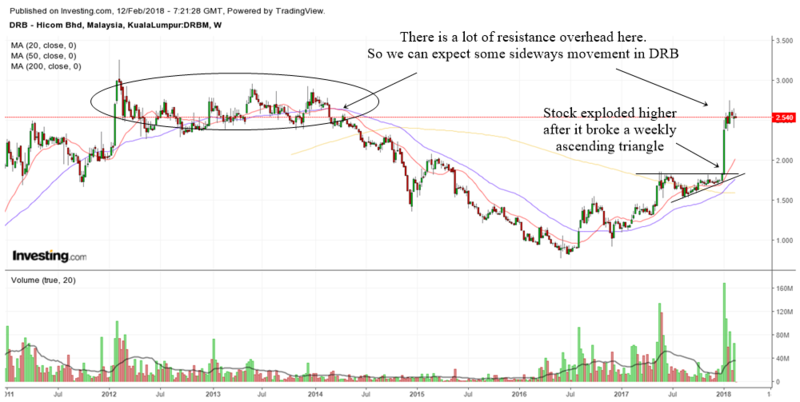 After the super nice run up in DRB Hicom, the stock is consolidating as it meets the long term resistance area. At this moment we can expect some sideways movement in the stock for quite a long time. This stock needs to have a rest as it absorbs the supply on the left. We will begin an analysis of this stock by looking at the weekly chart. The chart above shows the weekly chart of DRB Hicom. As you can see, the observant trader or investor would have anticipated a weekly ascending triangle breakout. Sometimes chart patterns forms and all it takes is some news to send it higher. The move up is now almost over as it has reach the resistance area formed long ago. I would say that the nice move up has already matured. Most experienced traders and investors would have got in at the bottom or the middle and right now they may even be taking some profits. 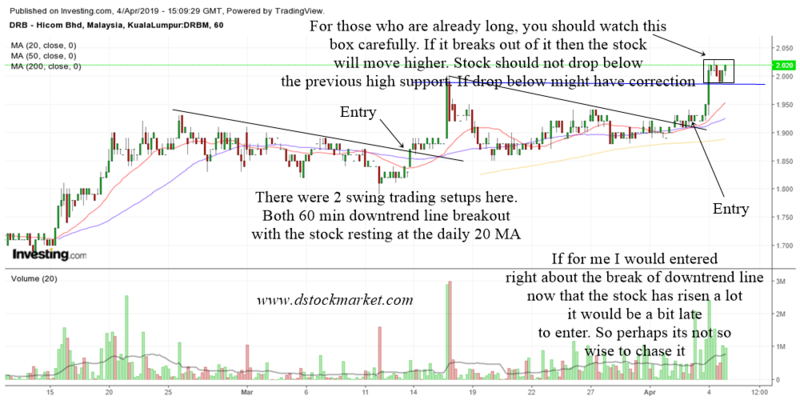 The chart above is the daily chart of DRB Hicom. There was an an explosive move up but the big nice moves are now over. 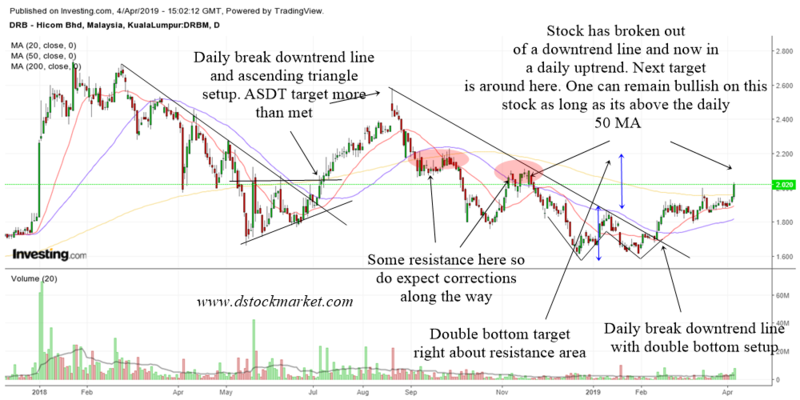 Sure there will be times when the stock can shoot up a day or two because it forms some continuation pattern in the 60 min charts. Those are more for active traders. 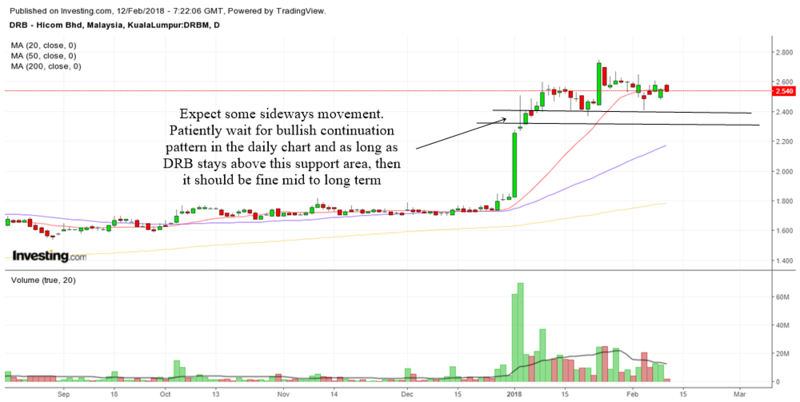 Right now, if you want to see DRB go higher in the longer term, you will need to see a bigger type of continuation pattern form. This sideways movement will help to absorb the supply on the left from the weekly charts. Notice the support area that I have drawn on the chart? As long as DRB stays above this support area, mid term to long term you should remain bullish.